Jo Wood Organics is certified organic by ECOCERT, the leading French certification organisation. After years spent mixing oils for her own personal use and for family and friends in what Jo now fondly refers to as her ‘home laboratory’, 2005 saw the launch of Jo Wood Organics, a sophisticated and decadent range of organic fragrance, bath and body care products. The years that have followed have seen the Jo Wood Organics brand gain respect within the organics industry, win numerous awards and Jo herself become a well-known advocate for organic living with appearances on television, at award ceremonies and industry events. She has even written a book. She has been on GMTV, Market Kitchen, Britain’s Next Top Model to name a few and she was voted one of Grazia magazine’s Women of the Year 2008. Jo’s inspiration for her Jo Wood Organics range is influenced by her passion for Africa; Jo’s mother is South African, and can trace family ancestors to the Zulu’s. The fragrances have been given Swahili and Xhosa names, Amka, Usiku, Tula and Langa. The video bellow is my review of the samples they gave me.Enjoy! 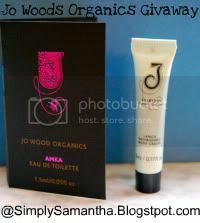 Thanks again to the ladies at Jo Woods that sent me the samples and aloud me to review them! have fun at the track! This is not an entry to your giveaway. Great review! Aw, what the heck, I'll enter your giveaway. :) I'll spread the word for you too. I also put the lovely button on the side of my blog. Hey im entering!! Sorry i didnt sooner. :) lol I do not have a twitter account so I facebooked it. Is that ok? :) And I'm putting the button on my blog.